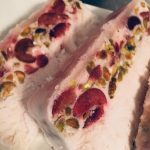 What is Semifreddo? The word ‘semifreddo’ is an Italian word that means ‘half frozen.’ It refers to and ice cream-like dessert that is whipped together by churning air into the mixture while it freezes. Semifreddos are often served in the form of ice cream cakes. 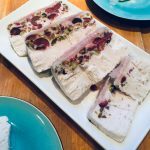 Light, airy and delicious this semifreddo recipe is so simple to put together and looks impressive to serve to family and friends. By using coconut milk instead of the traditional eggs and cream and sugar, this version of semifreddo reduces the guilt. 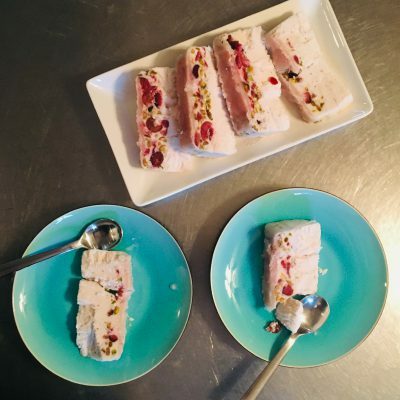 One of the biggest benefits of making semifreddo is that you don’t need an ice cream maker! 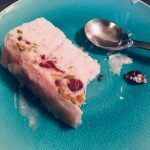 If you have a whisk or a hand mixer, you can put together a semifreddo. 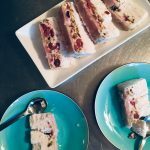 Light, airy and delicious this semifreddo recipe is so simple to put together and looks impressive to serve to family and friends. This recipe looks impressive and is lighter option for dessert at the end of a big meal. The red of the cherries and green of the pistachios look particularly festive for a dessert to serve around Christmas holiday season. Feel free to change up the ingredients! There are no rules here. You can omit the pistachios if desired or add chocolate chips for more indulgence. Strawberries, raspberries and peaches would be other great alternatives for fruit. This recipe looks impressive and is lighter option for dessert at the end of a big meal. Line an 8x4 loaf pan or freezer-proof container with waxed paper. Coarsely mash the cherries with a fork. Shell the pistachios and coarsely chop them. Scrape the thick layer of coconut milk into a bowl. Discard 1 tbsp coconut water from each can of milk and then add the remaining cans to the bowl. Beat until thickened and soft peaks form. Beat in the honey (or maple syrup or agave nectar). Gently stir in the pistachios and cherries and spread the mixture into the prepared pan until top smoothed out. Freeze for at least 4 hours or overnight until firm. Keep container level. 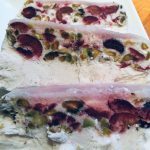 If frozen overnight, transfer the semifreddo to the refrigerator 1 hour before serving. Invert onto a plate or board and peel away the wax paper. Cut into slices and serve scattered with extra cherries. Omit the pistachios if desired. Add chocolate chips for more indulgence. Any other berry and peaches would be delicious also! Prev Order Your Very Own TFK Swag!